Not long ago I decided to write and publish my own ebook on long exposure photography. After teaching photographers about the technique and constantly being asked if I had a book about it I decided to make it happen. So I sat down and wrote out my thoughts. Then began the process of writing the eBook. When all was said and done the eBook came out great and is easy to read for anyone. My original plan was to self publish only, and after running some deals through group buying websites and gathering feedback it was clear that the book needed to re-published by a company. After much research and internal debates, I decided to pitch the book to a publisher and am happy to say that the process is underway. 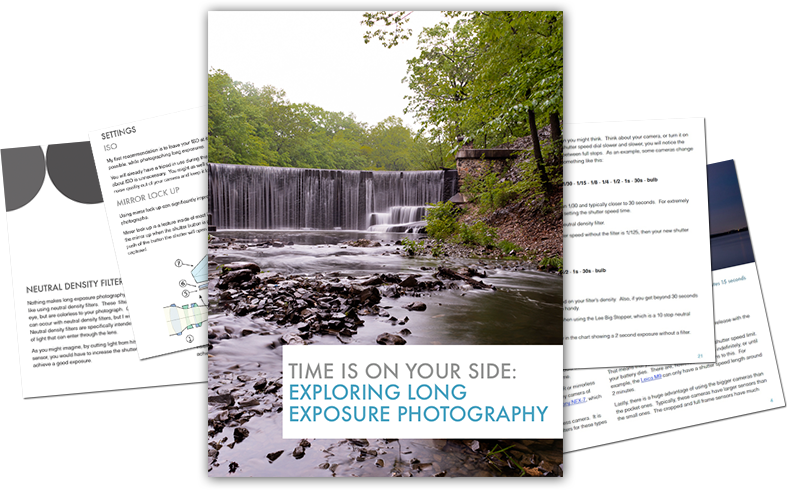 Before the re-design and publishing of the eBook is complete, I am glad to offer a 15% discount to 7×5 readers on Time Is On Your Side: Exploring Long Exposure Photography. Visit the eBook page and use the coupon code 7×5-15 on checkout. With that said, I encourage you to pick up a copy, if long exposure photography is an interest to you. You, like many others, might be happy that you did.